U.S. and Australian officials vowed Tuesday to raise the number of Marines rotating through Australia to 2,500 as soon as possible during the Australia-U.S. Ministerial Consultations, or AUSMIN, hosted by Stanford University’s Hoover Institution in Palo Alto, California. The current size of Marine Rotation Force Darwin is 1,587 U.S. Marines, with an additional eight MV-22 Ospreys and six M777 howitzers. It is currently the largest rotation to Australia for the Corps, which is now in it’s seventh rotation since kicking off deployments in 2012. 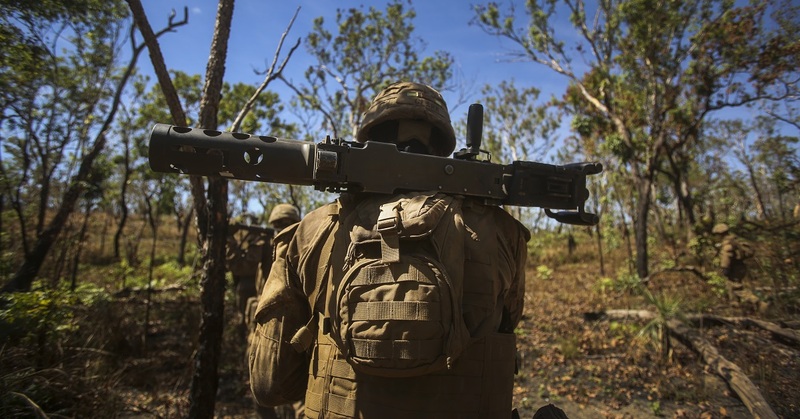 The Marine deployments to Darwin are part of the Force Posture Initiatives started under then-President Barack Obama and Australian Prime Minister Julia Gillard in 2011. The first few rotations to Darwin consisted of roughly 200-250 Marines. The intent of the initiative between the two countries has always been to grow the Marine presence in Australia to 2,500. The Corps has steadily been increasing its footprint in Australia over the years as the force begins once of the largest mass movements to the Pacific since World War II to counter a rising China. The Corps is also flexing forces to other areas across the Pacific such as Guam in an attempt to spread out its Marines generally clustered on Okinawa, Japan. About 22,000 Marines are stationed in Okinawa, Japan.